A giant pothole on High Street in Tullamore has been described as a 'danger to traffic' by one motorist who was unfortunate enough to hit it earlier today. As you can see from our picture above, the pothole is comparable in size to the manhole cover on the footpath. The following picture shows that an attempt has been made to fill it. One motorist the Offaly Express spoke to today in Tullamore commented, "that giant pothole is a danger to traffic. Because cars are parked on the other side of High Street, you can't really go around the pothole when cars are coming down the hill. 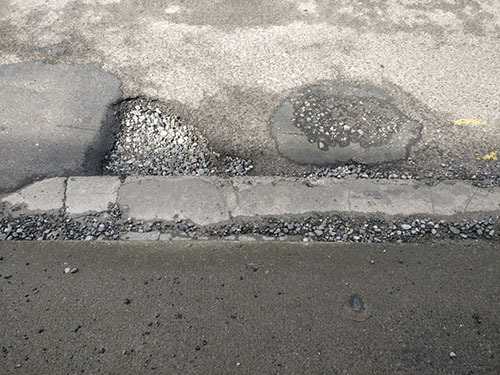 The whole of High Street is in a terrible state but this pothole being left there like that on the main street in Tullamore is just disgraceful." Another local we spoke to stated, "High Street has been in dreadful condition for years. It's about time the whole thing was ripped up and resurfaced. It's a terrible advertisement for the town."